Russia said Sunday it has successfully test-fired a "hypersonic" missile which is claimed to fly 10 times faster than the speed of sound. The Kh-47M2 Kinzhal (Dagger) system is called "an ideal weapon" by President Vladimir Putin as he unveiled a new array of next-generation arms earlier this month. Earlier this month Putin unveiled his nation's next generation of nuclear weapons in his state-of-the-nation address on March 1, ahead of a presidential election on March 18 that he is all but guaranteed to win. Each weapon system is engineered to slip behind America's vast network of early warning and defense systems. The Kinzhal missile was one of an array of new weapons. 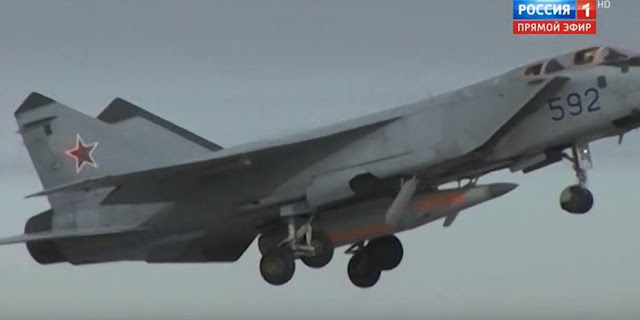 The high-precision Kinzhal missile was launched from a MiG-31 BM interceptor aircraft that took off from an airfield in Russia's Southern Military District, the Defense Ministry said on March 11. "The launch went according to plan, the hypersonic missile hit its target," the ministry added. Video footage released by the ministry shows two pilots gearing up for a flight and then running toward a jet carrying a large missile under its fuselage. Set to rousing, patriotic music, the video showed a missile detaching from the airborne plane and gliding across the sky, leaving a fiery trail. The massive twin-engine MiG-31 remains the fastest operational fighter capable of clocking a top speed close to Mach 3. Cruise speed is 2.35 Mach with a combat range of 1450 km. The missile can deliver nuclear and conventional warheads at a range of more than 2,000 kilometers (1,200 miles), the Russian president said, contending that it can overcome air-defense systems. The missile has been deployed in the Southern Military District since December 1, he added. Deputy Prime Minister Dmitry Rogozin said on Facebook that work had also been done to modernize the "unique" MiG-31 supersonic jet that will carry the missile. Since the start of the year, more than 250 sorties have been carried out by the aircraft to perfect the work of the missile systems, the Russian defence ministry said. The new missile is currently undergoing tests and the pilots involved are getting a grip of the cutting-edge munition during their routine service, Col. Valery Antsibor, Deputy Commander of Russia’s main test-piloting center, said. Tests of this nature also help the ground crews and all other military personnel involved to get familiar with the new missiles. 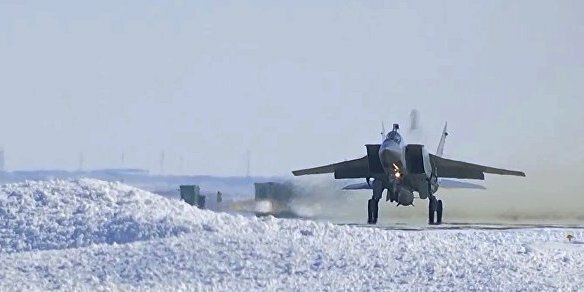 According to TASS news release, the system has no counterparts across the globe owing to high flight performance characteristic of the MiG-31 fighter jet and the hypersonic missile with a small radar signature and high maneuverability. The first air unit equipped with the Kinzhal system started test air alert flights to master fundamentals of its combat use since December 1 of the last year. Pentagon spokeswoman Dana White downplayed Putin’s comments, saying the U.S. military was capable of defending the country from any threats. U.S. State Department spokeswoman Heather Nauert said that, with Russia’s presidential election approaching, Putin "was playing to the [domestic] audience, certainly." The U.S. Defense Secretary, James Mattis, said that nothing Putin showed off changed anything from the Pentagon’s perspective, as he spoke to reporters as he traveled to Oman. One of the technologies Putin touted was a robotic torpedo that could hit a U.S. port city, but Mattis said that makes no difference as Russia already can target US port cities with missiles. “It doesn’t change anything other than how much money do they want to spend on something that does not change at all the strategic balance,” he said. Putin has rattled Russian sabers repeatedly in the past, and military analysts said a lack of detailed information made it difficult to assess his statements about weapons.